On a bright May morning in 2000 I spoke at the unveiling of a memorial in Cork City to the 1916 patriot Tomas Ceannt at Ceannt railway station. The Ceannt Memorial had been commissioned and erected by a committee of railway workers and was unveiled by Kathleen Ceannt, a niece of Tomas Ceannt. Last Friday the sun shone brightly down again as I laid a wreath at the memorial and later at St. Nicholas’s Church in Castlelyons in north county Cork where the Ceannt family, their friends and neighbours and thousands of admirers of Tomas Ceannt took part in his historic state funeral. For the last 99 years Tomas - sometimes referred to as ‘The Forgotten Volunteer’ - has lain in a shallow unmarked grave behind the walls of Cork prison. He was one of only two of the 1916 patriots to be executed outside of Dublin. The other was Roger Casement who was hanged in London. But in truth he was never forgotten. Not by his family and not by republicans who have celebrated his life and death, and those of the other patriots of 1916, each year since 1916. Nor is he the only Irish republican prisoner executed by the British and buried in the grounds of a prison. Just months before I spoke at the unveiling of the Cork station memorial in 2000 the remains of Tom Williams were finally laid to rest in a family plot in Milltown Cemetery in west Belfast. Tom Williams was only 19 years of age when he was executed in Crumlin Road Jail. A massive campaign, which included a 200,000-signature petition, to secure his reprieve was ignored by the British and Stormont authorities and the execution went ahead on 2 September 1942. Like Tomas Ceannt the body of Tom Williams had lain buried in an unmarked grave within the prison walls for 58 years. The Manchester Martyrs continue to lie in unmarked graves in New Bailey prison in Manchester. William Allen, Michael Larkin and Michael O’Brien were hanged in November 1867 for their part in an ambush to free two Fenian leaders. Their bravery in the course of an infamous show trial, their cry of ‘God Save Ireland’ from the dock, and their resolve and courage in the face of death sentences are the stuff of legend. Tomas Ceannt was born in 1865 at Ban Ard House, Castlelyons, one of nine children. As a young man he emigrated to the United States but returned in his mid-20s and became actively involved in the Land War. The Ceannt family had long been active in agitation against British rule, the Land War and a cousin was involved in the Fenian ‘dynamite campaign’ in Britain. Tomas was also a member of Cumann Luthchleas Gael (GAA) and the Gaelic League. However, Eoin MacNeill’s countermanding order to the Volunteers not to rise at Easter caused great confusion amongst their ranks outside Dublin. The failure of Roger Casement to get weapons through also meant there was a chronic lack of arms. The Ceannts and their local Volunteer company decided to secure what arms they had and to go into hiding. When they heard that the Rising in Dublin was over, the brothers decided to return home on the night of 1st May. Early the next morning, the house was surrounded by a party of RIC (Royal Irish Constabulary) who demanded their surrender. Despite being armed with only one rifle and three shotguns, the brothers gave no consideration to surrender. A fierce gunfight ensued. The Ceannt brothers were supported by their 84-year-old mother who loaded the guns. One brother, David, was injured, and RIC Head Constable Rowe was shot dead. The Ceannt’s were all captured when they ran out of ammunition. The RIC lined them up against the farmhouse wall and only the intervention of a medical officer prevented their immediate execution. As they were being led away, Richard Ceannt attempted to escape across the fields but was fatally wounded in the back. Tomas was taken to Cork Detention Barracks where he was strictly isolated from the other prisoners. There is a famous photograph of him and his brother William walking across the bridge at Fermoy (pictured). The hands of both are tied and Tomas is in his stockinged feet. They are accompanied by a British Army officer and three British Army soldiers shouldering rifles with bayonets attached. Behind them is a horse and cart in which it is believed lay the wounded David and Richard and their mother. Tomas Ceannt was charged with ‘waging war against His Majesty the King’ quickly court-martialled and sentenced to death. He was shot by firing squad on May 9th in Victoria Barracks, now Cork Prison by a British naval detachment from Cobh. He died, in the words of the British officer in charge, “very bravely, not a feather out of him’’. 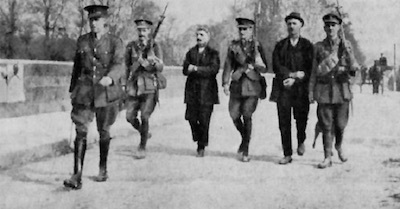 The British had by that stage already executed 12 of the leaders, including Tom Clarke, and Padraig Pearse. Tomas Ceannt’s execution was followed three days later, on May 12th, by those of James Connolly and Sean MacDiarmada and finally by Roger Casement on August 3rd. “My own view... is that the men who were shot in cold blood after capture or surrender were prisoners of war, and that it was, therefore, entirely incorrect to slaughter them. That is the calibre, spirit and fearless determination of the man re-interred last Friday. Like many other men and women before and since Tomas Ceannt demonstrated incredible courage and selflessness in the struggle to free Ireland from British occupation. Enda Kenny in his oration at the graveside was right when he said that “Ireland needs people who believe in their community, their country and in putting others before themselves” but his Ireland is 26 counties. His remarks are set in the context of partition and ignore the reality that a part of Ireland is still under the control of the British government. The approach of the Fine Gael/Labour Government to this Centenary has been shallow and wholly self-serving. Tomas Ceannt engaged directly in revolutionary armed activity against British rule in Ireland. He was what many successive Dublin Governments would have termed a ‘gunman’. Unlike the Government, Sinn Fein makes no apology for recognising this fact. We salute Tomas Ceannt’s stand and will not attempt, like the Labour leader Joan Burton, to re-write history to fit narrow party political objectives or to misrepresent the facts. This Government has nothing in common with men like Ceannt, nor any intention of promoting the ideals to which he dedicated his life. The Government’s Centenary commemorative events will not discuss the unfinished business of securing the full independence of Ireland. They will not seek to debate the failure of partition. Nor will they seek to debate the ideals of social equality which are at the heart of the 1916 Proclamation. They do not wish people to be reminded of the unfinished business of the Rising and the struggle for independence. The most fitting tribute to Tomas Ceannt and to the men and women of 1916 is to deliver the type of republic promised on the steps of the GPO on Easter Monday 1916 - a sovereign, 32-County republic in based on the principles of equality and social justice.